The LBMA Gold Price and LBMA Silver Price are the global benchmark prices for unallocated gold and silver delivered in London. Producers, the investment community, banks and central banks, fabricators, jewellers and other consumers as well as market participants from around the globe, transact during the IBA Gold and Silver Auctions and use the benchmarks as reference prices. The ability to transact and reference a single transparent price, produced by a regulated benchmark administrator provides significant benefits to the market. The LBMA Gold Price and LBMA Silver Price facilitate spot, monthly averaging, cash-settlement, location swaps, fixed for floating swaps, options and other derivative transactions important to price risk management. Please read IBA's benchmark and other information notice and disclaimer here. The LBMA Gold Price and LBMA Silver Price are benchmarks regulated by the UK’s FCA. IBA is a regulated benchmark administrator, authorized to administer the LBMA Gold Price and LBMA Silver Price. IBA operates electronic auctions for spot, unallocated loco London gold and silver, providing a market-based platform for buyers and sellers to trade. The auctions are run at 10:30am and 3:00pm London time for gold and at 12:00pm London time for silver. The final auction prices are published to the market as the LBMA Gold Price AM, the LBMA Gold Price PM and the LBMA Silver Price benchmarks, respectively. The price formation for each auction is in US Dollars. The final price is converted into the benchmark in multiple currencies including: Australian Dollars, British Pounds, Canadian Dollars, Euros, Onshore and Offshore Yuan, Indian Rupees, Japanese Yen, Malaysian Ringgit, Russian Rubles, Singapore Dollars, South African Rand, Swiss Francs, New Taiwan Dollars, Thai Baht and Turkish Lira. N.B. The gold and silver auctions settle against US Dollars only. The benchmarks in the other currencies are not tradeable directly through the auction. The terms of reference of the Precious Metals Oversight Committee include reviewing the methodology. 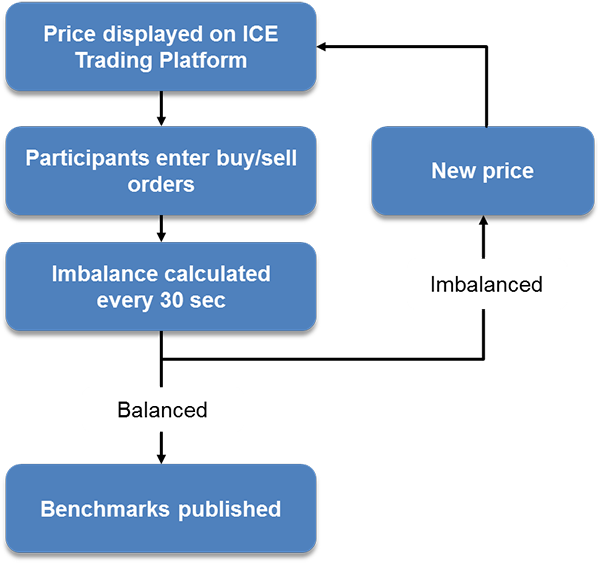 The auction process runs on the ICE Trading Platform which provides real-time order management, separation of house and client orders, live credit limit controls, a full audit history, compliance monitoring tools and advanced straight through processing using ICE’s APIs for trade capture, order entry and surveillance. The auctions run in rounds of 30 seconds. At the start of each round, IBA publishes a price for that round. Participants then have 30 seconds to enter, change or cancel their orders (how much gold/silver they want to buy or sell at that price). At the end of each round order entry is frozen and the system checks to see if the difference between buying and selling (the imbalance) is within the imbalance threshold (normally 10,000 oz for gold and 500,000 oz for silver). If the imbalance is outside of the threshold at the end of a round, then the auction is not balanced, the price is adjusted and a new round starts. If the imbalance is within the threshold then the auction is finished and the price is set. Any imbalance is shared equally between all direct participants (even if they did not place orders or did not log in) and the net volume for each participant trades at the final price. The final price is then published as the LBMA Gold Price or LBMA Silver Price in US Dollars and also converted into the benchmarks in other currencies using foreign exchange rates from when the final round ended. The prices during the auction are determined by an algorithm that takes into account current market conditions and the activity in the auction. Each auction is actively supervised by IBA staff. Participants also have 30 minutes directly before the auction starts to queue up their orders. This is known as ‘Round zero’. The IBA Gold and Silver auctions are centrally cleared which allows a broad range of firms to become Direct Participants. Central clearing for the auctions is enabled by the ICE Daily Gold and ICE Daily Silver futures contracts. These are physically settled, daily futures contracts for loco London gold and silver. All Direct Participants must be able to centrally clear futures contracts, but they also have the option to select their preferences for a cleared or bilateral match against each other Direct Participant. At the end of the auction the volumes are matched up, with priority given to matching the bilateral preferences first, if possible. A firm will receive a bilateral match only where they have set their preference against another Direct Participant to bilateral, and the other Direct Participant has done the same, and there is volume that can be matched between the two firms. Volume which is not matched and settled bilaterally must be converted into centrally cleared, daily futures contracts submitted to ICE Futures US at the benchmark price via exchange for physical (EFP) trades. These trades will be submitted for the Direct Participant by ICE Metals Broking. When taken to delivery, the cleared futures contract settles according to the spot convention. The metal is settled as unallocated metal via London Precious Metals Clearing (LPMCL) accounts and the cash component settles at ICE Clear US. Indirect Participants are clients of a Direct Participant. They manage their own orders in the auction via the ICE Trading Platform and at the end of the auction they have a bilateral trade with their Direct Participant. Direct Participants share the imbalance, whereas Indirect Participants do not. IBA is responsible for ensuring that there is appropriate governance over the IBA Precious Metals Auctions and the LBMA Gold and Silver Price benchmarks, and that the appropriate standards of conduct are met. IBA does this through the Code of Conduct that all Participants are required to adhere to and through the Precious Metals Oversight Committee which has broad representation from the Gold and Silver markets. Decisions by the Precious Metals Oversight Committee are made in accordance with IBA’s Consultation Policy which means that relevant stakeholders are consulted on material changes to the benchmark methodology. The members of the committee attend in an individual capacity and are selected to represent different segments of the industry. Committee members are respected industry veterans that bring important product and market expertise to the governance process. Committee members are selected by IBA’s Nominating and Corporate Governance Committee in accordance with IBA’s Committee Selection Policy. Committee members rotate periodically. Clients wishing to use or redistribute the LBMA Gold and Silver Prices require a license. To obtain a license, or to find out if you need one, please use the online licensing wizard. The types of licenses and methods of accessing the benchmarks are set out below. The data vendor codes (including RICs) are available here. The auctions can be viewed live on the ICE Trading Platform, Thomson Reuters, Bloomberg and FastMarkets (Bullion Desk). Transparency Reports are available from IBA and data vendors. The Transparency Reports provide the volume and price information for each round of the auctions. IBA also publishes the benchmarks and Transparency Reports on a delayed basis free of charge on the Historical Data & Reports page. LBMA Gold Price and LBMA Silver Price will be made available on this page at midnight London time. Uses the LBMA Gold and Silver Prices as a reference rate in transactions and financial products including (but not limited to): swaps, FRAs, options. Redistribution License is required for any party that redistributes the LBMA Gold and Silver Prices to third parties, either real-time or delayed. Trading/Clearing License is required for any party that offers trading/clearing of financial contracts for which the LBMA Gold and Silver Prices are the underlying reference, typically a trading venue or clearing house. ETP Issuer License is required for the issuance of exchange traded products (ETPs), such as an exchange traded fund (ETF), where the benchmark serves as, or part of, the underlying reference. Note: Clients may find it easier to view the contents of the FIXML file using Microsoft Excel to tabulate the data into headed columns. To do this, save the file to your computer, then drag and drop the file onto an open Microsoft Excel window and select 'As an XML table' when presented with the 'Open XML' dialogue box (you may need to click 'OK' again if asked whether to create a schema based on the XML source data). Since the benchmarks are derived from the price of the final round of the auctions, they do not have set publication times, but are instead defined by the expected starting time of each auction. The LBMA Gold and Silver Prices are not published on certain days. The auctions settle spot Gold and Silver. This means that the settlement date is the auction date plus two good UK business days. If that date is a US holiday, then the settlement date rolls forward to the next day that is both a good UK and good US business day. Please see the LBMA’s website for further details.